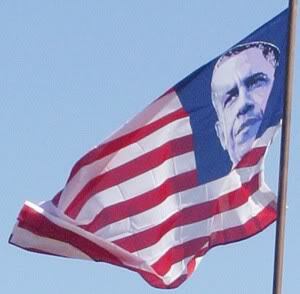 Folks are starting to fly the Obama and Stripes instead of along with the Stars and Stripes. After a short stand off between a group of veterans and the head of the Lake County, FL Democrat Party, an American flag that had been altered to depict an image of Barack Obama in the space where the stars are normally located was taken down. I believe in the Constitution and I find it ironic that those who exercise their First Amendment rights are so strenuously trying to destroy our other amendment rights. I'd like to see many politicians wearing black and white stripes. "Unsettling" is an understatement. My blood runs cold looking at that.